Problem: Bring more diversity to fridge notes. 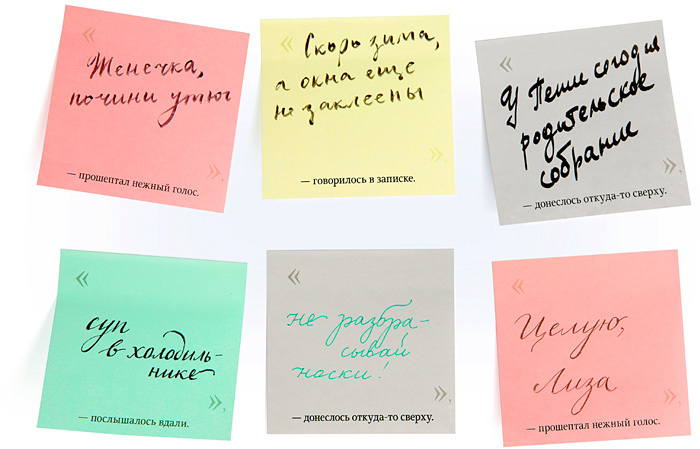 Direct Speech sticky notes, sized 7.5×7.5 cm (2.95″×2.95″), feature quotation marks and punctuation used in Russian for indicating direct speech and a variety of reporting clauses. “Zhenechka sweetie, fix the garment steamer,” a gentle voice whispered. “Winter’s coming, but the windows aren’t sealed,” read the note. “Today’s Peter’s parent-teacher conference,” was announced from above. “Stew’s in the fridge,” came from afar. “Pick up your socks,” was announced from above. “Kisses! Lisa,” a gentle voice whispered.